It seems like just yesterday I was talking about our 1 year anniversary. Time sure does fly. Today Co-Optimus turns two and the Staff and I are extremely proud of what we've accomplished. Co-Op gaming is more popular than ever; developers, publishers, and gamers have all joined in on the Co-Op Revolution. I've compiled a few stats from our site and database over the past year to put some perspective on just how huge things have got. - When we launched on January 28th, 2008 we had 120 co-op games in our database. Now we have almost 1000. - Since we launched over 275 co-op titles have launched across all platforms totaling 480 games in all. - Our first year we gained 2000 community members, we now have almost 5000. - Our community has added over 7000 games to their collections and used our match making tools over 5000 times in the last year. - Co-Optimus.com has had almost 8 million unique visitors over the past year looking for co-op gaming news, information, and coverage. - In the past year we held 29 co-op nights being officially features on Xbox Live, Xbox.com, Games For Windows.com, DawnofWar2.com, and more! - The Co-opticast, our bi-weekly podcast we started a little over a year ago, has had more than 18,000 downloads. We would like to share with you one small piece of that - a brand new logo for the site. As things come together in the coming weeks and month we'll have plenty of giveaways and ways to celebrate. We'll be covering PAX East, E3 and PAX Prime this year as well as some other exclusive events! Remember you can visit our store and purchase stickers and shirts to support the site, or click any of the various links to partners around to support us as well. We're always open for feedback, requests and tips which you can send to our tip email. Everyone go out and play some co-op games tonight. If you're looking for someone to play with, hit up our forums, or - you could join our official Army of Two: The 40th Day Co-Op night Tonight on Xbox Live. 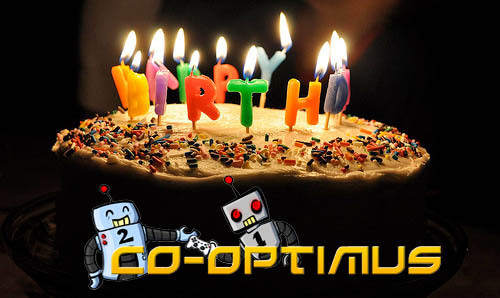 Thank YOU for visiting Co-Optimus and making it your prime source for co-op gaming. Page created in 0.8489 seconds.